Hand hygiene compliance is considered essential to prevent healthcare-associated infections, but very few studies have been conducted assessing compliance in the prehospital setting. This observational study conducted in Finland, Sweden, Denmark and Australia identified a suboptimal hand hygiene compliance among emergency medical service indications. The results suggest a tendency to self-protection and over-reliance on gloves among emergency medical service providers (≤15%). The average compliance was 3% before touching the patient and 19% after having touched the patient. Gloves were worn in 54% of all hand hygiene indications. Despite consistent efforts, the prevalence of healthcare-associated infection remains 5%–10% among patients in developed countries. These infections are associated with increased mortality, economic burden, and suffering for the patients and their families,1 thus emphasising a need to focus on prevention in everyday practice. Risk of infection is related to three key factors, the infectious agent, the host and the environment, and often the transmission of microbes takes place through direct or indirect contact via the hands of the healthcare provider.2 Contamination occurs during care and treatment when touching either patients or surfaces contaminated with viable pathogens from humans. The longer the duration of care and treatment, the higher the degree of contamination.3 Hand hygiene (HH) is the most effective action to prevent the spread of microbes, and adherence to hygiene routines improves the quality of care and patient outcome.2 Most acute hospitalisations begin in the emergency medical services (EMS), and the providers encounter a wide range of patients in varying surrounding during single shifts, often with little or no knowledge about infection status and transmission risk. Despite these facts, hygiene in the EMS receives little attention, and most studies have focused on bioterrorism and disaster preparedness, rather than basic infection control.4 Prehospital infection control and prevention studies have focused on microbial contamination in the ambulances and on the medical equipment along with cleaning measures. However, to our knowledge, only three studies have observed HH compliance among EMS providers,4–6 and they do not assess HH compliance using multiple before and after patient parameters, nor are their results based on data from multiple countries. The aim of our study was to provide an assessment of HH compliance, glove behaviour and adherence to basic hygiene parameters regarding hair, nails and the use of jewellery among EMS providers across multiple countries and professions. We also wanted to investigate potential risk factors related to lack of HH compliance. We conducted a prospective observational study including EMS providers from Finland, Sweden, Denmark and Australia from December 2016 to May 2017. All included countries have written hygiene guidelines, but the degree of implementation is unknown. Two observers each did 30 hours of non-participating observation (6 hours a day, during the daytime, on weekdays, in one pre-determined week) in each of the four countries. The participants were either defined as basic-care providers or advanced-care providers and employed by either a public or a private EMS organisation. The annual number of patient cases across participating cities ranged from approximately 60 000 to 400 000. Enrolment was conducted from a convenience sample of EMS providers that were on duty on the preplanned data collection days. Only front-line personnel from ground vehicles was included. The participants were informed about hygiene being the overall subject of observation, but not that HH was the exact focus. The observers looked at three areas: hand hygiene, glove behaviour and basic hygiene parameters. Observations were conducted on five HH indications, according to the WHO ‘Your five moments for hand hygiene’ validated scheme7 8 (figure 1). Observers were instructed that if two indications occurred continuously (eg, when going from an after contact to a before aseptic procedure), this was considered as only one indication for HH. Hand rub and hand wash procedures were defined using the WHO definitions: ‘hand rub’ is applying an antiseptic hand rub to reduce or inhibit the growth of micro-organisms, and ‘hand wash’ is washing hands with plain or antimicrobial soap and water.7 Use of gloves is only recommended if there is a reasonable risk of contact with blood or other potentially infectious materials, mucous membranes or non-intact skin.7 Assessment of glove behaviour had three outcome possibilities: when new gloves were put on, if one pair of gloves were used continually through more than one HH indication or if no gloves were used. Adherence to basic hygiene parameters was visually assessed by recording compliance to recommendations on short clean nails (no visible soil, and white tips <3 mm long), no use of nail polish (bare nails), having short or up done hair (no longer than to the chin/neck), and no use of rings and watches9 10 (see online supplementary appendix 1 and 2 for Australian and Finnish guidelines, respectively). Finally, gender and provider level were recorded. Data were initially recorded on paper and then entered directly into STATA 14 for analysis. To prevent entry errors, each variable was evaluated in relation to predefined expected values by running the STATA codebook command. The primary outcome was HH compliance. Secondary outcomes were differences between countries, and associations between HH, gender and provider level, and between HH and glove use. Descriptive analyses of all variables were conducted overall and by country, and the results presented by frequencies and percentages. Country comparison and assessment of the association between HH compliance, glove behaviour, gender and provider level were conducted using χ2 tests if the expected frequency were above 5. If the expected frequency were below 5, Fisher’s exact test was used. Additionally, we performed univariate and multivariate analyses to assess whether provider level, gender and use of gloves could be regarded as potential risks factors related to lack of HH compliance using logistic regression. We corrected for interaction in the multivariate model if any association was detected. In all analyses, Alpha was 0.05. During 240 hours, 77 EMS providers were observed, 87 patient cases completed and 1344 HH indications recorded (71 individual providers, as two from Finland and four from Sweden were observed twice because of their work schedule). Table 1 shows that provider level, gender and observed indications varied significantly by country. Hand rub was the preferred HH action as hand washes only were observed seven times (all after patient contact). The overall HH compliance was 15% regardless of HH indication, but when analysing the data per indication, we found a compliance rate of 3% before patient contact, 2% before clean or aseptic procedures, 8% after the risk of contact with body fluids, 29% after patient contact and 38% after contact with patient surroundings. The compliance rate varied significantly according to the country of origin. The Danish providers had the highest compliance rate regardless of indication (table 2). In total, the use of gloves was observed in 720 (54%) of all 1344 indications. New gloves were observed in 48% of all before patient contacts, but only in 14% of all clean or aseptic procedures. Continuous use of gloves (wearing a pair of gloves through more than one HH indication, for example, after touching a contaminated site, and then returning to the patient) was observed in 21% of the before patient contacts, and in 64% of the observed before clean or aseptic procedures. Moreover, the use of gloves varied significantly by country (table 3). The adherence to basic hygiene parameters regarding nails, hair and jewellery among the EMS providers was higher than the HH compliance. In total, 83% of the EMS providers had short, clean nails, 99% had short or up done hair, and 62% did not wear jewellery. Furthermore, the adherence by country did not vary significantly, except regarding wearing jewellery (table 4). HH compliance did not vary by gender (16% men vs 13% women, p=0.175), but by provider level (basic-care providers 21% vs advanced-care providers 12%, p=0.000). Wearing gloves did not vary by gender (male providers 53% vs female providers 55%, p=0.399), but it did vary by provider level (basic-care providers 42% vs advanced-care providers 57%, p=0.000). HH compliance was observed in 2% of the 720 indications where gloves were worn, whereas it was observed in 30% of the 624 indications where no gloves were worn (p=0.000). In multivariate analysis, non-compliance with HH was associated with wearing gloves (OR 45; 95% CI 10.8 to 187.8; p=0.000) and with provider level (OR 1.7; 95% CI 1.1 to 2.4; p=0.007), but not with gender (OR 1.3; 95% CI 0.9 to 1.9; p=0.107) (table 5). We found a low HH compliance rate both in general and on a country level. The behaviour of the EMS providers showed a tendency towards self-protection instead of patient protection, that is, with a higher compliance rate after patient contacts than before patient contacts and with an over-reliance on gloves. We observed the use of gloves when there was no apparent need (no observed risk of body fluids, etc). There was also a high rate of continuous use of the same pair of gloves throughout several HH indications. The adherence to hygiene parameters regarding hair, nails and the use of jewellery was better with an overall adherence rate from 62% to 99%, depending on the parameter. Moreover, the risk of non-compliance was related to glove use and provider level. This multicentre study is the first to assess HH compliance in accordance with WHO recommendations, along with adherence to recommendations regarding hair, nails and jewellery among various EMS professions across multiple countries, and thus providing a broader assessment than seen before. However, this also makes it difficult to compare our results with prior findings. To the best of our knowledge, only three HH-related observational studies have been conducted in the EMS setting (two American and one Swedish), and these studies also found HH compliance among EMS providers to be suboptimal with a tendency to self-protection.5 6 11 The issue of self-protection has two aspects, both the greater HH compliance after patient contact and the over-reliance of gloves, and therefore it is important to note that HH is about preventing the spread of microbes and thus protecting the patient. Whereas, the use of gloves primarily is about protecting oneself from body fluids, and so on. 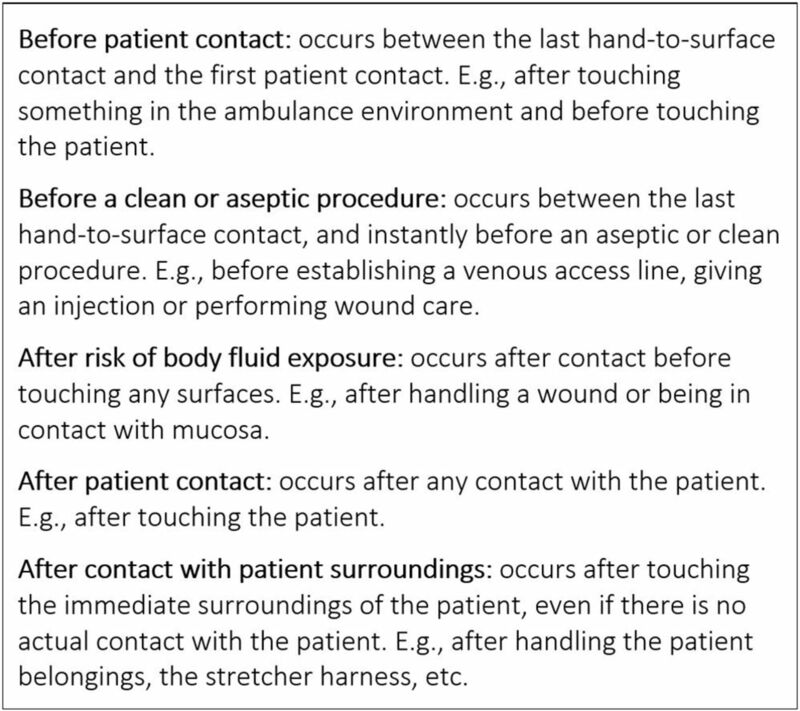 The WHO ‘Five moments for hand hygiene’ may be challenging to comply fully with in demanding clinical practices, and they may need some simplification to be feasible in the EMS. Also, it is important to remember that although HH is not a complicated procedure, it still needs to be learnt, trained and continually practised before it becomes a routine. We found a poor HH compliance both overall and in each of the enrolled countries, and thus potential improvement strategies should be discussed. One challenge to HH compliance in the EMS setting is lack of access to supplies at the point of care.11 Access to running water and soap is often restricted to the ED, and hand rub is often only available in the ambulance. A potential solution to such a challenge is to accept the use of presoaked wipes suitable for skin hygiene as an alternative to hand wash and to hand out pocket-sized hand rub bottles to the EMS providers. Despite WHO’s recommendations specifying that HH should be performed before putting on gloves and after removal of gloves,7 the amount of HH actions we observed did not match the use of gloves. A possible explanation could be that gloves are regarded as a substitute for HH by the EMS providers as reported elsewhere.14 It could also be that wearing gloves preclude HH actions,11 15 which is in line with the association between non-compliance and wearing gloves we found in the present study. However, further investigation of these presumptions is needed. The different HH compliance rates found in the enrolled countries in our study is especially interesting in relation to future improvement strategies. All four countries had written hygiene guidelines, and all providers were educated within the field of emergency care and treatment, and thus should be equally informed about the nature and necessity of hygiene. However, the Danish EMS had been accredited a few years ago.16 This accreditation process brought focus on several clinical parameters, including hygiene, which may have resulted in the significantly higher HH compliance in Denmark. However, we are unable to investigate the potential cause–effect relation in the present study. Insufficient training, time pressure and limited access to hygiene supplies have been reported as challenges related to EMS HH compliance.4 6 14 17 18 WHO recommends a multimodal approach to HH compliance, and such will imply a variety of strategies in order to clarify both practical and behavioural barriers.7 As far as we know, only one study has investigated how to improve EMS-related HH, and the authors reported that a theoretically based PowerPoint presentation on HH importance and practice, along with increased access to HH supplies, and visually reminding posters, improved the hygiene awareness and motivation.18 Also, a recent Australian study reported that situation-based learning had a positive impact on medical students’ knowledge and attitudes towards HH.19 Future studies elucidating motivational factors in relation to EMS HH compliance are highly recommended to strengthen future multimodal improvement strategies. The fact that our data collection, as the first ever, was conducted across different countries, including both private and public organisations and multiple EMS professions, contributes to the study generalisability. However, although statistically significant results have been attained in some areas, the numbers reported are reasonably low, and thus country-specific interpretation should be made with caution. Observation of HH compliance is considered ‘the gold standard’,20 but one must assume that our study design is challenged by the observer influence known as the ‘Hawthorne effect’, where the observed tend to increase their effort to ‘please’ the observer, and there is no doubt that the EMS providers were under some influence of the observers. Nevertheless, it should be considered a strength that the EMS providers were unaware of the precise observational focus and that they were informed about data being anonymised before being analysed. Also, both observers did their best to blend in and limit their appearance as much as possible. Moreover, the two observers collected the data in all four countries, and thus the interobserver variation should be limited.20 The chosen WHO validated data collection scheme is considered suitable for all healthcare settings,7 but not commonly used in the EMS. HH compliance among EMS providers was remarkably low and higher after patient encounters compared with before patient encounters. In addition, there was an over-reliance on gloves, indicating a tendency towards self-protection instead of patient protection. We recommend further research on contextual challenges and hygiene perceptions among EMS providers to clarify future improvement strategies. A big thank you to Falck Emergency in Denmark and Sweden, EMS of the Peijas district in Uusimaa, Finland and Ambulance Victoria in Australia. Without their effort and interest, this study would not have been possible. World Health Organization (WHO). Report on the Burden of Endemic Health Care-Associated Infection Worldwide A systematic review of the literature. 2011 (accessed 5 Jun 2018).
. Health care-associated infections: sources and routes of transmission: INTECH Open Access Publisher, 2012. World Health Organization (WHO). Guidelines on Hand Hygiene in Health Care: A Summary. 2009 http://www.who.int/gpsc/information_centre/hand-hygiene-summary/en/ (accessed 5 Jun 2018). Statens Serum Institut (SSI). Nationale Infektionshygiejniske Retningslinjer. 2016. Available at https://www.ssi.dk/Smitteberedskab/Infektionshygiejne/Retningslinjer/NIR.aspx (accessed 5 Jun 2018). Stockholm County. Medicinske behandlingsriktlinjer. 2017. Available at http://www.aisab.nu/media/49863/2015_medicinska_behandlingsriktlinjer.pdf (accessed 5 Jun 2018). The Danish Institute for Quality and Accreditation in Healthcare (IKAS). Introduction to DDKM. Available at https://www.ikas.dk (accessed 5 Jun 2018). The World Medical Association, INC. Declaration Of Helsinki, Ethical Principles for Medical Research Involving Human Subjects. https://www.wma.net/wp-content/uploads/2016/11/DoH-Oct2008.pdf (Accessed 30 May 2015).